Siddhartha, who later became known as the Buddha – or The Enlightened One – was a prince who forsook the comforts of a palace to seek enlightenment. He realised the essential unreality of the world and experienced the bliss of Nirvana. After his enlightenment, he spent the remainder of his life teaching others how to escape the endless cycle of birth and death. Buddha was born approximately 400 BCE in the area now known as Nepal. He was brought up in a palace with all the comforts and luxuries possible. Growing up a young noble prince, it is said his father sought to shield the young prince Siddhartha from the pain and suffering of the world. It is said his father had a premonition that Siddhartha would one day renounce the world. However, at one point in his early adult life, Siddhartha sought to find a greater meaning to life. In disguise, he left the palace and wandered around the kingdom. Here, Siddhartha came across different people suffering from old age and illness and witnessed death. This showed him the transitory nature of life, which had a great impact on him. As a consequence, Siddhartha resolved to seek a deeper meaning of life. Secretly, Siddhartha left the palace – leaving behind his wife, son and all the worldly comforts that he had enjoyed. He devoted himself to meditation, seeking enlightenment amongst the ascetics of the forest. 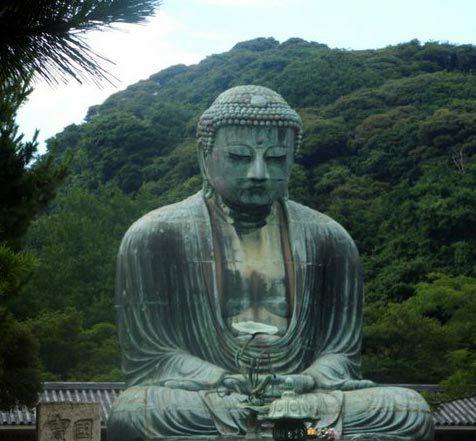 In his intense quest for enlightenment, Siddhartha fasted excessively so his body wasted away; however, despite his great efforts enlightenment still remained a far cry. At one point, a passing woman gave him some food to eat and Siddhartha realised it was a mistake to seek enlightenment by torturing the body. He regained his strength and resolved to follow a ‘middle path’, avoiding excesses of both fasting and feasting. On one day, Siddhartha resolved to sit under a Bodhi tree until he attained enlightenment. For several days, he sat in meditation seeking Nirvana. He was tested by various forces which tried to prevent him realising the goal. However, Siddhartha was successful and entered into the blissful consciousness of Nirvana for several days. On returning to normal consciousness, Siddhartha the Buddha (Buddha means ‘enlightened one’) made the decision to spend the remainder of his life teaching others how to escape the inherent suffering of life. For many years, Buddha travelled around India, especially around the Ganges plain and in Nepal, teaching his philosophy of liberation. His teachings were transmitted orally and not written down until many years after his death. Many stories relate to the life of the Buddha in this teaching phase. His essential teachings were of love, compassion and tolerance. The Buddha taught that a seeker must have compassion for all living beings and this was the most important teaching. Although the Buddha disliked formal rules, a monastic following sprung up for those interested in following his path. He advocated strict celibacy for those wishing to follow his monastic path. The Buddha would often give talks on enlightenment, but on one occasion, he simply held up a flower and maintained silence. Many left not understanding the point, but when later questioned, the Buddha replied that his real teaching could only be understood in silence. Talks could only give limited intellectual information which was not real enlightenment. The Buddha sought to avoid deep philosophy, he avoided using the term God, preferring to talk about the practical way that a person may escape the cycle of birth and rebirth and attain enlightenment. Like many spiritual teachers, he often taught in parables to keep his teachings simple and practical. The Buddha attracted hostility from those jealous of his popularity and spiritual development. One of his own monks Devadatta later became jealous of the Buddha and sought to split the community. He even tried on three occasions to kill the Buddha, but on each occasion, he failed. The Buddha passed away after many years of teaching and travelling throughout India. On his deathbed, he told Ananda (his dearest disciple) that he should now rely on his teachings and own ethical conduct to be the guide of his life.